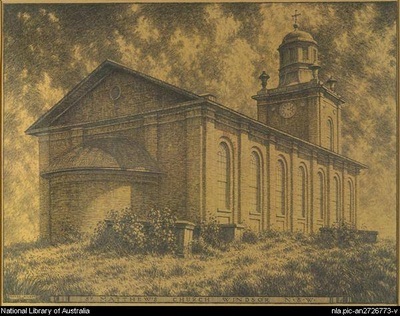 William Hardy Wilson was another Australian artist, architect and author for whom the Georgian architecture of Thompson Square and the Hawkesbury was of great interest. He was born in Campbelltown, studied at the Sydney Technical College and took instruction in art from Sydney Long. 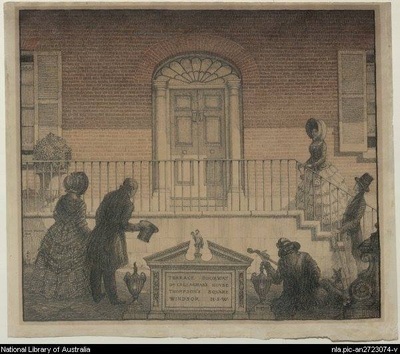 Determined to make Australians aware of their early colonial heritage as Americans had become of theirs, Wilson began to make drawings of colonial buildings in NSW and Tasmania. He looked at buildings with a painter’s eye as well as an architect’s, even noting the plants in their gardens. 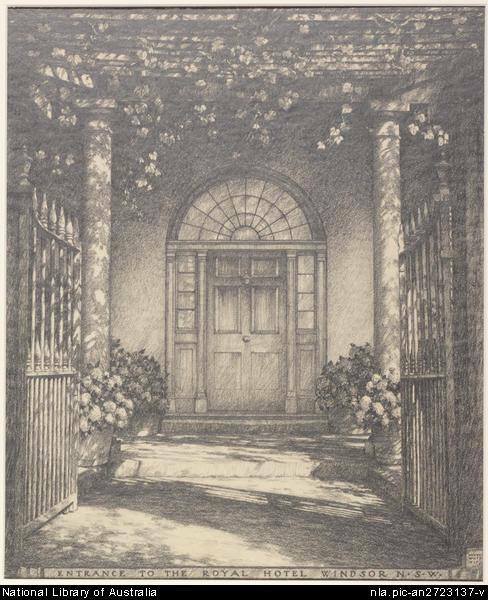 In the words of one of his biographers ...“With the pencil of the architect, the pen of the author and the eye of the artist, Hardy Wilson recorded the beauty of the old buildings.....” And thus it can be said of his approach to the buildings of Thompson Square. 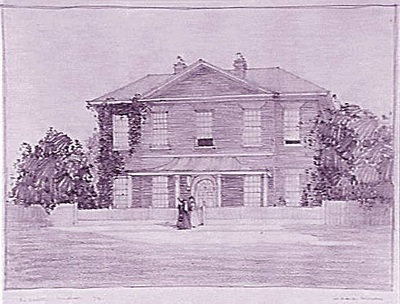 He seems to have been captivated by the Doctor’s House, making several beautifully sensitive drawings of it. Similarly, the entrance to the Macquarie Arms (Royal Hotel) is almost ethereal in its treatment....it looks softer and sweeter in his image with its hanging flowers than it does today. 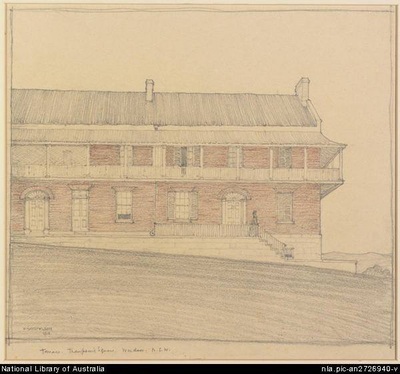 For Wilson, “ Francis Greenway was an artist in the art of architecture.....he was the most accomplished architect to reside in Australia.” And so for Wilson, the drawing of St Matthews was a way of approaching how Greenway thought and felt about his buildings. Wilson’s drawing of St Matthews is approached with reverence. The building is bathed in soft afternoon sunshine and a quick look at the clock tells us the time of day that Wilson made the image. The sky is alive with soft clouds...or is it the foliage of trees? In his visits to the Hawkesbury, Wilson recorded the Cox Homestead at Clarendon, and Hobartville, St. Peter’s and The Oaks at Richmond. 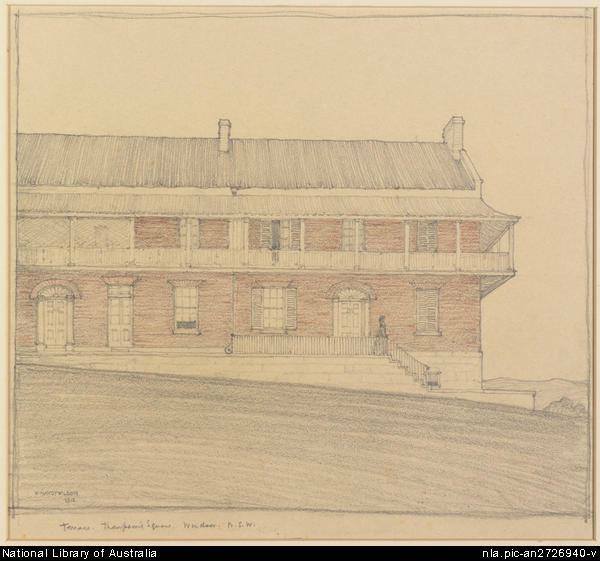 We, here in the Hawkesbury, should feel proud that so many examples of our colonial buildings have been immortalised in Hardy Wilson’s Collection which is held by the National Library.